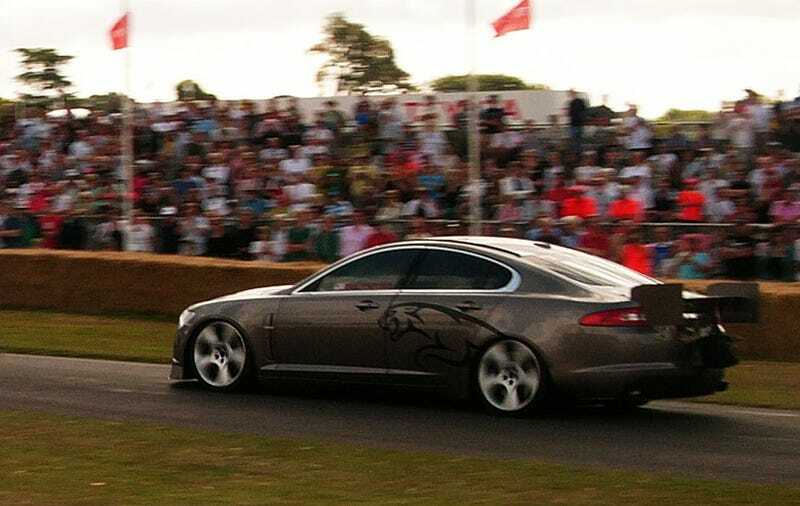 Among many incredible Jaguars at Goodwood was their fastest production car ever, the 2010 Jaguar XFR. With stock tires and a wing on the back, it did 225 MPH before being paraded in the South of England on Sunday. For almost two decades, the fastest Jaguar ever was the XJ220, that troubled turbocharged cruise missile riding on the tails of Jaguar’s very successful late 80s endurance racing program. After racing driver Martin Brundle took one for a ride around Nardò at 217 MPH, it became not only the fastest Jag, but the fastest production car ever, eclipsed only by the McLaren F1. That was 17 years ago. These days, Jaguar no longer makes slippery supercars but has become quite a player in sports coupés and sports sedans for people who wouldn’t want to be seen in a Bimmer. And while the top speed for production cars has since crept up by 40 MPH or so, it’s still quite a surprise that succeeding the XJ220 in the fastest Jag department is a souped-up family sedan. The XFR Prototype taken to 225 MPH at Bonneville by 24 Hours of Daytona-winning Paul Gentilozzi is not a limited-edition techie supercar but is almost American in its wonderfully brute method of going about its business. Said business is nothing but speed, achieved with a 500 HP, 5-liter V8, located behind an expanse of chicken wire. The car Gentilozzi assaulted the lakebed with differs only slightly from this production version: all it had in extra was a chin spoiler, a rear wing, a roll cage and a reprogrammed ECU nudging an extra hundred HP out of that supercharged V8. The XFR Prototype was one of many Jags at the Goodwood Festival of Speed and it wasn’t even the most remarkable when it comes to producing noise in copious quantities. Consider that a warning. Footage of 1950s Le Mans racers will soon follow.